Celebrated guitarist Phil Keaggy releases his best, solo, vocal album in 23 years. Not since his masterpiece “Crimson & Blue,” has he produced such a joyful and bluesy romp on the fret board. Buy it! Now! 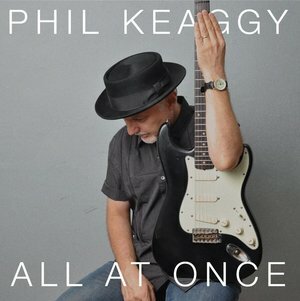 “All at Once” is the vocal album Keaggy fans have long been waiting for. The last twenty-five years of Phil Keaggy’s extensive discography have featured many fine moments; however, most of the top moments have been instrumental, and most of the top vocal moments have been collaborative efforts. “Dream Again,” released in 2006, was his last solo project of all original songs, and it was, regrettably, forgettable. Honestly, it’s an album I never listen to and had even forgotten existed. Before that, similar things could be said about “Inseparable” in 2000. “Phil Keaggy,” released in 1998 was an overall solid effort with many well-crafted tunes, but it lacked the aggressive guitar licks and fun that one expects from a Keaggy release. You really have to go back to “Crimson and Blue,” that beautiful opus to blues rock that made the listen sit up and take note and wonder how and why this album didn’t conquer the world. I traveled eight hours in the spring of 1994 to see Phil and band on the Crimson and Blue Tour, and it is, was, and will ever be the greatest show I’ve ever seen. By my count, Phil played eleven songs that night with a running time two hours. Yeah, it was mad-jamming, and I could barely breathe when it was done. It was phenomenal. These magical moments on his solo albums over the years have been few and far between. But not anymore. The title track is a terrific ballad which continues to showcase his wonderful playing. What becomes evident at this point, is that the music of this album is put together in a purposeful way to maximize the collaborative efforts of the amazingly talented musicians that Phil is playing with on this album. One of the best things about a Keaggy concert, besides the ridiculous guitar playing, is Phil’s fun-loving, playful personality. This comes across clearly in several tunes on the album, including the upbeat Beatlesesque love song “La La La Love You,” the tongue-in-cheek and totally awesome “My Guitar’s in Love” and the all-out blues love-fest “Stay Home Baby.” Toes are guaranteed to be tapping! “Fearless Love” begins with an inticing piano intro and then the guitar kicks in sounding like something off Keaggy’s electric instrumental album “220.” But this is an upbeat vocal track hightlighting both guitar and piano. The instrumental middle segment is one delicious guitar riff giving way to a piano solo. The piano and guitar trade off with each other, prodding each other with an inprovised feel that you’ll want to listen to over and over. Keaggy taps veteran Ashley Cleveland to sing the tune “Ezekial,” and her deep, full-voice is a terrific complement to this familiar feeling blues song. “Breathe” is the only instrumental track on the album. It’s a beautiful piece which starts out with an ethereal acoustic feel, until subtle layers of electric guitar give way to Keaggy’s signature guitar riffs. This is clearly reminiscent of his other masterpiece “The Wind and the Wheat.” I love this song so much. I fell asleep to it the last couple of nights. It makes me want to sit on a mountain top and think about the realities of life. Terrific. Lyrics: The album’s lyrics are encouraging and uplifting, focusing on issues of Keaggy’s Christian faith and on human relationships. Production: All the songs sound warm and alive. Absolutely terrific sounding. Bottom line: This is an album that any Keaggy fan will treasure. This is also an album for anyone who appreciates blues/pop rock and top-of-the-line guitar playing. For some reason, it isn’t available (or at least not yet) for download on any site. But don’t let that stop you. Plop down the $15 and enjoy yourself some intelligent and fun music. Guaranteed to get your mind off the presidential race! I’ve been a Phil Keaggy fan for thirty years. I try to make it to any concert of his I can simply because he’s one of the best, and not just guitarists. He’s one of the best people. Here’s a podcast of an interview a Cleveland station did of him prior to his two shows at Nighttown in Cleveland. He’s currently doing a Kickstarter project for a new vocal album he’s ready to produce. If you want to waste a lot of time, just Youtube search him for examples of his amazing abilities. He’s also moved well beyond labels, and as an indie musician, I fully support him. He may not have the wide public acclaim that he could have had if he would have remained a mainstream artist, but inside the industry of serious musicians, it would be hard to find someone who doesn’t know and admire Phil Keaggy. Check him out! Here’s his Kickstarter campaign. He’s almost at his $30,000 goal. Remember When Music Was Expensive? In a recent post, a student of mine stated that music nowadays is expensive; therefore, it’s okay to download the illegal stuff. I quickly corrected him, telling him that music is not expensive. In fact, music is cheap. Here’s proof. I started with that dreaded phrase that all youth hate to hear: when I was your age. (But it’s true.) When I was their age, I, too, collected music, but I did so on ’45s (It’s those small black record disc thingys for you young people). If there was a hit song on the radio that I wanted such as Bob Seger, 38 Special, The Police, ELO, or even Eddie Rabbit’s “I love a rainy night”, I smacked down my very hard to get earnings or allowance and paid the $1.09 or $1.19 it required to get my song. Of course I also got a free “B” side at the same time which had a stupid song that nobody liked. I couldn’t afford LPs during my high school days, but I did start to buy cassette tapes my senior year in high school. Remember joining Columbia House to get those twelve cassettes for 1 cent and then buy 5 more for exorbitant prices? Anyways, then CDs started hitting the racks. Once I got my first CD player I was in the market for the latest and greatest invention there ever was. My first CD ever was Phil Keaggy’s amazing “Sunday’s Child” from 1987. I bought it for $18. EIGHTEEN DOLLARS! That wasn’t the only CD I ever bought for that price. I would hit the stores for bargain prices and every once in a while I’d find one for $12 – quite the steal! That’s why for about a 10 year period, I probably cancelled Columbia House and re-signed up about five times because music was so expensive! Fast forward between 20+ years and what has happened to the pricing structure of music? It has dropped significantly because the advent of the MP3. Now I am a bargain music buyer. I usually buy all my albums off of Amazon a few months after they are released for $5. Occasionally, I’ll splurge for the $7.99 or $8.99 album which sometimes have as many as 15 or more songs. If there is the occasional band or artist that I really like (there aren’t many) I’ll buy it upon release, regardless of the price. Gulp! Sometimes it’s $9.99 or $10.99! To re-cap, individual songs are cheaper in 2014 than they were in 1984. Albums are anywhere from 200% to 33% cheaper in 2014 than they were in 1994. Music is not expensive. Music is reasonably priced, meaning that there is no good way to justify going around the law to download music which gives no credit or compensation to the artist. Let’s make it a habit to support the artists that we enjoy by giving them a little love – and a little money.